TGIF HOT TIME + GOODIES CAN YOU TOP UP MY HEART? Enjoy the 300% EXP boosting during the Lunar New Year Holiday! DNP 1+1 Event has arrived! Get prepared for February by joining the DNP 1+1 Event. If you top up during the event period, any top up amount below 200,000 EYET will receive the same amount in DNP, and any top up amount above 200,000 EYET will receive 200,000 DNP. - DNP will be given on 12th February 18:00 HRS (GMT+8). - The given DNP will be usable until the date of the March Update Patch (12th March 9:59 HRS). - Any top up amount below 200,000 EYET will receive the same amount in DNP. Any top up amount above 200,000 EYET will receive the maximum DNP, which is 200,000 DNP. If you top up 5,000 EYET during the event period, you will receive 5,000 DNP. If you top up 199,000 EYET, you will receive 199,000 DNP. If you top up 230,000 EYET, you will receive 200,000 DNP. Will you be my Valentine? Log in on Valentine’s Day and receive a sweet gift for all. - Rewards will be collectible by characters of all level. 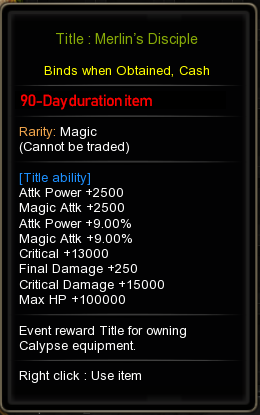 Some rewards may be collectible for character above level 50. 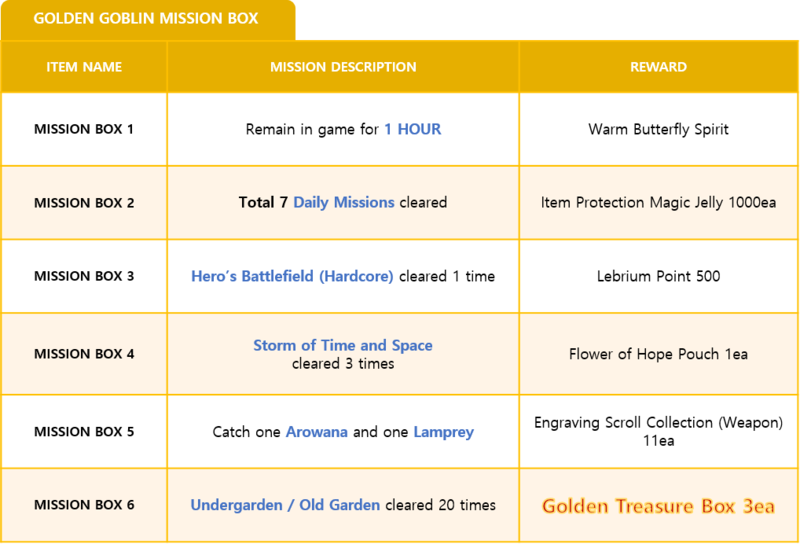 ◆ You'd be clearing the [Golden Mission Box's Mission 2] as well! Get rewards to help [Golden Mission Box’s Mission 5] and the [Power Up Gears Season 2] Event! During the first week after the Update Patch is the prime time to get busy with Daily Missions! Show us your Daily Mission mastery skills and receive rewards! ※ Hard Fishing Rod (7-day duration item) reward has been increased to 30-day duration item! - Event is ACCOUNT BASIS : The total number of Daily Missions cleared by all your characters within your account will be counted together. 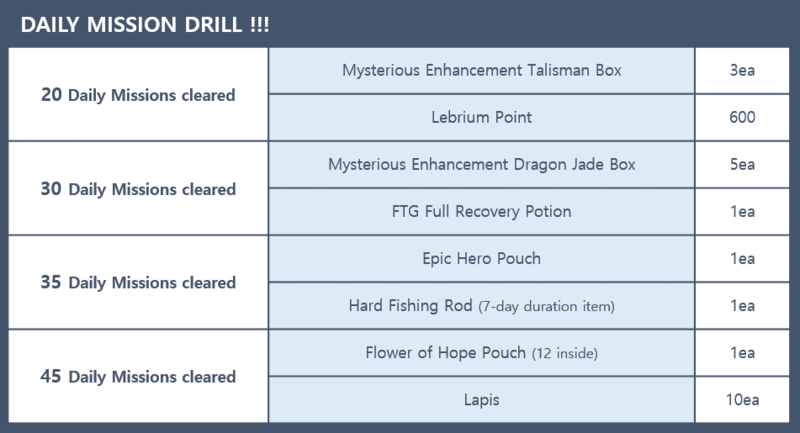 Example) If you cleared 34 Daily Missions in total within your account using 5 characters during the event period, you will receive "Mysterious Enhancement Talisman Box 3ea, Lebrium Point 600, Mysterious Enhacement Dragon Jade Box, FTG Full Recovery Potion" reward to your account. - Rewards will be sent ACCOUNT BASIS to your Special Storage on 21st February 18:00 HRS (GMT+8). - Rewards will be collectible for 1 week, until 27th February 23:59 HRS (GMT+8). This is an ingame event. Please refer to the February Patchnote for details. ◆ Get rewards to help get ready for the [Power Up Gears Season 2] Event! Get the Golden Treasure Box for the chance to reap mountains of gold! Complete these row of six missions and you will attain the coveted Golden Treasure Boxes at the end. *For Mission Box 6's mission, "Undergarden / Old Garden cleared 20 times" is correct. A box that contains varying amounts of gold. Depending on your luck, you can receive up to 100,000 Gold per box! [Mission Box 1] will be waiting for you in your Special Storage on 12th February after the Update Patch. Collect the [Mission Box 1] and open it to begin the missions! Every time a mission is cleared, you will receive the mission rewards, including the next Mission Box. - The Mission Box 1 (1 PER ACCOUNT) will be given through Special Storage. - The Mission Box 1 can be collectible starting from the February Update Patch on 12th February until the March Update Patch. You can collect and begin anytime during this period. - Mission Boxes that are not collected/opened, will be taken out on the February Update Patch date. - The items given after opening the Mission Box are automatically given through Special Storage, including the next Mission Box. - Mission Box reward items that are not collected will also be deleted on the February Update Patch date. 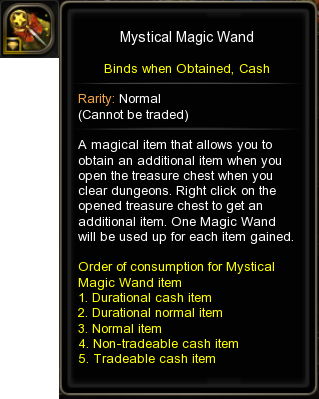 - All Mission Box reward items are not tradable. - The total number of Mission Boxes for this event is six. The [Mission Box 6] is the last box. It's a golden piggy bank that will bring you immense luck! 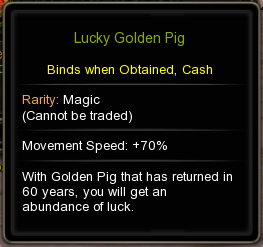 Celebrate the "Year of Golden Pig" with the Lucky Golden Pig Mount. - Rewards are accumulative. You will receive all three rewards if you gather more than 20,000 "Blood, Sweat & Tears Points" during the event period. - The "Blood, Sweat & Tears Points" can be attained by successfully completing the missions of the [Hero's Mission Bulletin Board]. >>> The record of the total amount of "Blood, Sweat & Tear Points" attained will be counted for the event, not how much is left. Therefore, using of the points during the event period will not affect your chances. - Rewards will be given ACCOUNT BASIS to your Special Storage on 27th February 18:00 HRS (GMT+8). - Rewards will be collectible for 1 week, until 5th March 23:59 HRS (GMT+8). 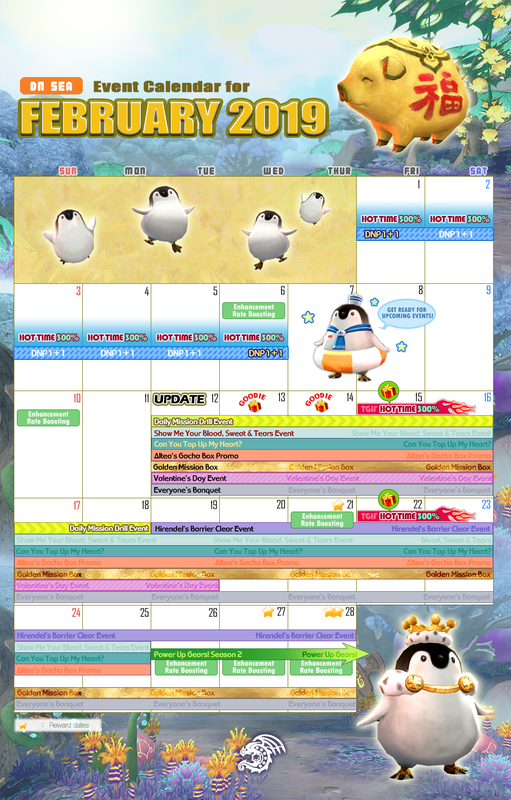 - For information on the new system of Hero's Mission Bulletin Board, please refer to the February Patchnote. ◆ Get rewards to help clearing events! This month special, your Fridays are going to burn up all night – cause it’s TGIF HOT TIME 300% on every Friday! Log in on Friday nights to receive helpful goodies and get boosted! EXP 300% Boosting will be applied during the following times. - EXP 300% Boosting will be applied from Friday 6:00 PM until the 3:00 AM the next day (9 hours each time). During this time frame, you can also collect the [Foll Fatigue Recovery Potion 1ea] reward. - The rewards will be sent ACCOUNT BASIS via Special Storage, collectible by character over Level 80. CAN YOU TOP UP MY HEART? Top Up this month and receive these amazing rewards! - Rewards will be given ACCOUNT BASIS and will be collectible for character above Level 95. - Rewards are accumulative. If you top up over 200,000 EYET, you will receive all the rewards. - Note that the Pet Speech Bubble item is 30-day duration item. 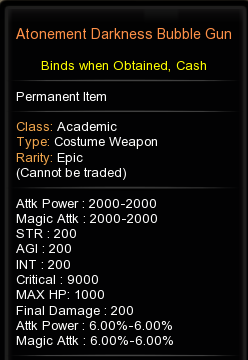 - The two exchange coupons for the Atonement Darkness Weapon can be used to get 1 main weapon and 1 secondary weapon. Both are the same exchange coupons, therefore it is up to your choice which weapon type (either main/secondary and by class) you want to exchange it for. - For information on how to use the Atonement Darkness Weapon exchange coupon, please refer to February Patchnote. If you purchase the following number of Altea's Gacha Boxes at the Cash Shop during the event period, you can select one among Altea's Gacha Box key items as a reward. To check out the new Altea's Gacha Box items, click HERE to go to Patchnote. - Rewards will be given through special storage on 28th February at 1800HRS (GMT+8). - DNP purchases are NOT eligible. Lagendia Gacha Package will NOT be eligible. - Rewards are collectable until 6th March 2359HRS (GMT+8). ◆ You'd be halfway to clearing [Golden Mission Box's Mission 6] as well! Get rewards to help get ready for the [Power Up Gears Season 2] Event! Heroes, let’s give a warm welcome to the two new stages at the [Hirendel’s Barrier]. Clear the new stages, [Old Garden] and [UnderGarden] and receive rewards that could help you to get enhancing. *For information on [Hirendel's Barrier] Please refer to the February Patchnote. - You can clear either or both [Old Garden] and [UnderGarden] of any difficulty level. Both will be counted together. - Rewards will be collectible for 1 week, until 13th March 23:59 HRS (GMT+8). Time to knock on Berlin’s Door! Will you be able to undergo ten enhancement trials during the 10-day period? It will be the best time to try! ▶a. ENHANCEMENT RATE BOOSTING : 20% boosting will be applied EVERYDAY at 18:00 - 22:00 HRS (GMT+8) during event period. If you clear one of the criteria below, you will receive the Title reward! Disciple type A Players who enhanced at least 10 tries for equipment parts Hero’s Calypse Tier 2 Enhancement Level 1 and above during the event period, regardless of success/fail of enhancement. Disciple type B Players who have at least one equipment part that is Skila Enhancement Level 5 or above by the end of the event period (7th March 23:59 HRS). The due date is 7th March 23:59 HRS (GMT+8)! Let's get enhancing! 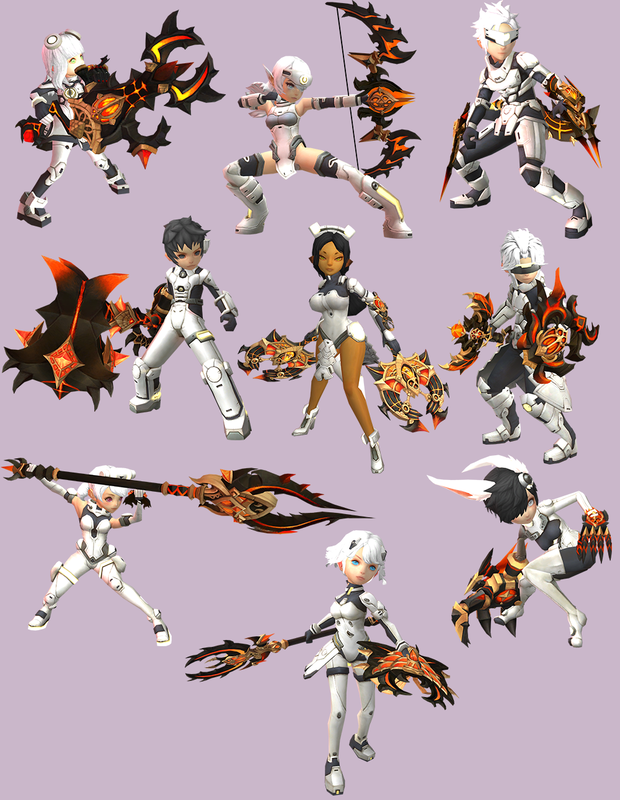 - Disciple type [A] : Whether the equipment enhancement try was successful or failed does not matter, as long as the equipment parts are Hero’s Calypse Tier 2 Enhancement Level 1 or higher (Skila included). - Disciple type [A] : It does not matter which part of equipment is enhanced. Each enhancement try will be counted as 1. All players who have tried enhancing 10 times or more during the event period will receive the title reward. - Disciple type [B] : Regardless of the event period, if you have in possession a Skila Enhancement Level 5 or higher equipment part(s) by the time of 7th March 23:59, than you will be eligible for the title reward as well. 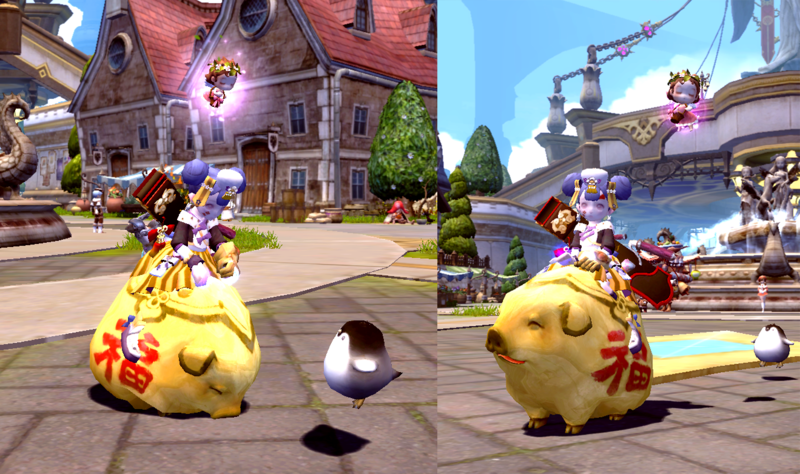 - The title reward will be given ACCOUNT BASIS via your Special Storage on 12th March 23:59 HRS (GMT+8). - Rewards will be collectible for one week, until 18th March 23:59 HRS (GMT+8). Rewards that are not collected and expired will not be reimbursed or resent. There's a Forum Event coming up on March! Event details will be posted on Forum’s Event Board page on the event date. Find out the event details on 1st March! *Cover Title colour will be decided by GMs, the name of the cover title can be chosen by participants. ... the full details will be released on the Event date! Please refer to the February Patchnote for details. ▶ For more information check the February Patchnote. All of the DNP will be removed on February’s Update Maintenance as a monthly DNP reset Policy. This includes the DNP Vouchers as well, so please make sure you purchase as many items as possible with your DNP before the Update date.